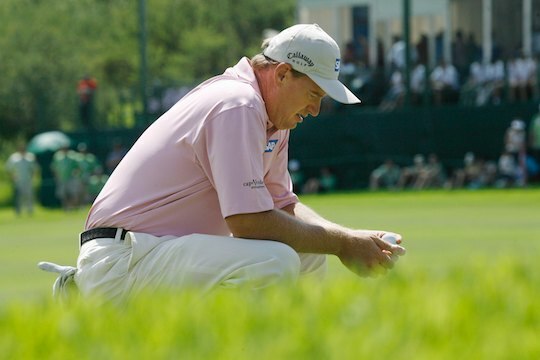 Golf fans are still talking about Ernie Els’ now-famous seven-putt in 2016 at Augusta National. And despite the fact the now 49-year-old Els has twice finished runner-up in the US Masters, he has declared he has had enough of the punishment dished out by one of the world’s most famous golf courses, Augusta. “How many times do you want to run into a wall,” Els told a US newspaper. To his credit, the two-time US Open champion and twice British Open winner has kept coming back for more punishment, despite that stunning seven-putt there in 2016. Yet still the course wouldn’t relent. In 2017 Els finished the Masters 20-over-par and now admits he’s always had a love-hate relationship with the place. “When a thing stings you, it keeps stinging you,” said Els. “When it gives to you it keeps on giving. Yet Els has gone so close to donning a Green Jacket – which would get him invited back to play every year for as long as he wanted to. His closest call came in 2004 when American Phil Mickelson holed an amazing birdie putt on the final hole to deny Els his shot at victory. “You start disliking the place when you shouldn’t,” he said.